Talented but inconsistent, Russia's Yuriy Borzakovskiy snatched the Olympic men's 800 meters title, timing a late surge to the line to perfection, against all expectations. Borzakovskiy, who was second in last year's Paris World Championships, was certainly a dark horse. In a field that contained world record holder Wilson Kipketer of Denmark, World champion Djabir Said Guerni of Algeria and Kenyan Wilfred Bungei, the fastest over the distance in the world this year, and Mbulaeni Mulaudzi of South Africa not many gave him a chance. Kipketer is widely regarded as one of the greatest runners at the distance but he has never an Olympic gold. He was expected to fulfill his dream and win Olympic glory this time in Athens. But it was not to be. 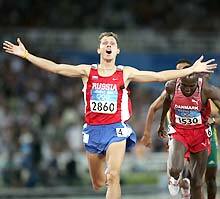 The 23-year-old Russian powered past him and Mulaudzi in the final few strides to win in one minute 44.45 seconds. Mulaudzi out-dipped Kipketer to take silver in 1:44.61 to add to the world indoor gold he won in March. Kipketer, the three-times former world champion and world record holder, had to be content with bronze in 1:44.65. Kipketer stamped his authority on the field 200 meters out and coming off the final bend looked set to win the elusive Olympic title. The 31-year-old former Kenyan world champion in 1995, 1997 and 1999 seemed to produced the winning kick as he broke away from the bunch, but he did not think about the capabilities about Borzakovskiy, a twice former European champion. The Russian surged towards the line with a powerful burst in the last 60 metres to leave Kipketer in such a state of shock that he even forgot about Mulaudzi on his inside. The South African, third in last year's World Championships, snatched the silver. Kipketer's era might well be over, but there is another star on the horizon. Yuriy Borzakovskiy, our Olympian of the day.